Do you remember that song that came out in the 80’s but unfortunately was still playing in the early 90s? The one that goes “ooh heaven is a place on earth”? Well, I hate to admit it but there actually is a heaven on earth and it’s called Smorgasburg. For those outside of the Brooklyn/New York food loop (it’s real, and I live there) Smorgasburg is a seasonal, open-air food market, that is open every weekend from April to October. Saturday’s in Williamsburg. Sunday’s in Prospect Park. Naturally, I had to be there this year for opening weekend. Smorgasburg is probably the most amazing but also anxiety-driven food location, simply because the options are endless. Want double-sized mozzarella sticks? Sure. Interested in a donut made of spaghetti? No problem. This “dessert” made quite the splash last year when in debuted at Smorgasburg, so of course I had to see what all the hype was about. Now that I’ve tried it, I still don’t understand the hype. Raindrop cake was on that awkward border between “I think this is gross” and “this tastes like nothing”, but definitely didn’t send my tastebuds soaring. GladI tried it but it was a one-and-done. Raindrop Cake is apparently a variation on shingen mochi served with a side of brown sugar syrup and roasted soybean powder. Clearly I should’ve anticipated the lackluster taste as soon as I learned the ingredients. If I had to describe Raindrop Cake, it would be flavorless jello. Not my cup of tea, but many seem to enjoy it. Personally, I’d prefer cake. The Classic Ube Halo Halo is a scoop of ube (purple yam) ice cream, with diced dragonfruit, mangoes, blackberries, tapioca pearls, red mung beans, jackfruit, toasted coconut flakes, and coconut milk. I would willingly eat this for breakfast, lunch, dinner, and a post dinner snack; which I guess is kind of healthy considering the amount of fruit? The flavors mix perfectly together giving off that naturally sweet taste which I prefer over over-the-top sweet desserts. For an extra dollar your Halo Halo will be served in half a dragon fruit, which for the first time is definitely worth it for the presentation. Unless you’re living under a rock, you’ve probably heard of the infamous Ramen Burger. I’m going to cut to the chase and say, the only thing I disliked about Ramen Burger was the $12 price tag for such a tiny burger. This is made worse since, accoridng to a friend of mine, they’ve actually decreased the size of their burgers while increasing the price. If you look up the menu for Ramen Burger’s new permanent location, their burgers (plus their pork sandwich on Ramen buns) generally go for $9-10 with sides so I’m going to assume the inflation for Smorgasburg is due to the cost of renting a stall for the whole season. Aside from that, the Ramen Burger was delicious especially the secret soya sauce. The ramen buns are sturdy enough to keep their texture but soft enough that you can easily bite through it. But attention isn’t just paid to the ramen buns and sauce, the burgers are delicious as well and perfectly cooked. Very tasty. Very worth it. If you’ve never had matcha before, it’s a ground powder of specially grown and processed green tea. If you’ve ever had a green tea latte from Starbucks, you’ve had it, and it’s become so popular there are now handfuls of matcha dessert spots all over the city. Of course combining two of my favorite things (green lattes and banana pudding) meant that ordering this was a no brainer for me. A small is only $5 and packs tons of flavor along with extra Nilla wafer crumbs on top. While the original flavor, which I sampled, was also delicious, I’m a sucker for twists on simple ideas. Destination Dumplings served five different flavors at their Smorgasburg stand: Classic (Pork + Chive), Kalbi Korean Beef, Jerk Chicken, Edamame, and Peking Duck; of which you can either order a Single (4 dumplings of one flavor) or a Double (8 dumplings of two different flavors) Forewarning, it’ll take about 20-30 minutes until your order is ready but you’re free to roam the other booths and then return. While I was debating between the Korean beef and classic dumplings, I ultimately decided to keep it simple. That being said, these dumplings still managed to stand out, with a perfect sear and void of that overly oily feel that you may experience at other locations. The pork and chive, though also simple, were seasoned to perfection and served with a side order of dipping sauce. 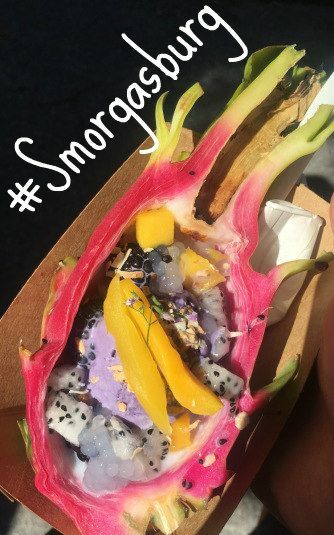 If you’re planning or hopefully I’ve convinced you, to head on down to Smorgasburg for the first time, I would highly recommend researching the current vendors or checking out the official Smorgasburg Instagram to plan out your must-eats before you get there. Trust me, it’s a little overwhelming to be presented with so many options at one time. Also, if you can get there at opening time (11:00 AM), do it! I got there at about 11:15 AM and could’ve had my pick up the booths. But once it hit 1:00 PM, you were barely able to move while making your way to a fifteen minute line. If I failed to convince you, well hey, more Ramen burgers for me. Found this post interesting? Pin it on Pinterest!